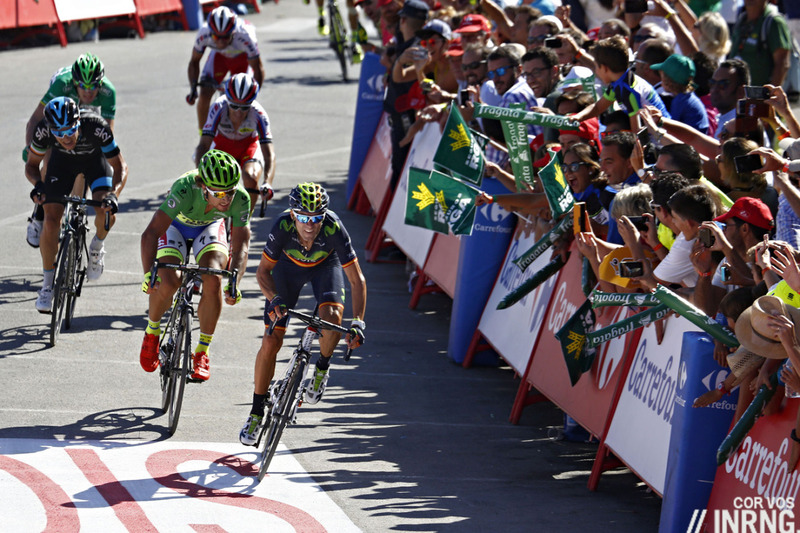 Who is the better rider, Peter Sagan or Alejandro Valverde? It’s topic for a café chat but they can and are ranked arithmetically by the UCI and Valverde topped the rankings for 2015. Now cycling’s governing body is launching a new rankings system f0r 2016. Released by stealth with a Christmas Eve press release it’s got little coverage since. Still, points can be the currency of the pro cyclist’s jobs market and the ranking system often matters to teams and fans alike. With this in mind here’s an explainer along with tables listing all the points to scroll past. There’s also a warning about confusion because if the UCI is launching a new ranking it’s also keeping an old one and they’ll both have similar sounding names. Let’s begin with the name of the new system: the UCI World Ranking. Not the World Tour and this matters because it’s meant to be a universal system for all male riders rather than just World Tour riders. So it’ll now feature every rider to win a UCI point around the world from any UCI races. 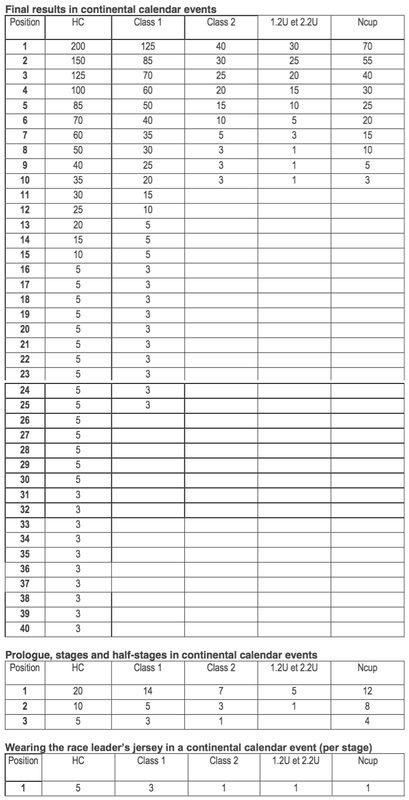 Points scale: here are the points per race grabbed from the UCI rulebook which explains the less than great presentation but all points are going to be listed here for the sake of completion and reference. If you’re in a rush, scroll to the “Analysis” heading after the data dump of tables. Which races? From the World Tour down to any *.2 race, plus U23 *.2 races and national and continental championships. In short everything on the UCI’s road calendar with the exception of criteriums ( marked CRT). Weekly updates: the rankings will go out every Monday once the UCI has added and subtracted the results for the past week. National rankings: as well as the individual classification there will be a national one based on the best eight riders per nation. Rolling basis: one big change is the rolling calculation. It is based over a 52 week period rather than the calendar year, or at least it will be once it’s been up and running for a year. It means the scores are not reset at the start of the season. If a rider doesn’t score in a race they’ve previously won or placed well in then they’ll drop down the rankings like Peter Sagan off La Rochette. Points per race: another significant change is the attribution of points. The Tour de France remains the prime race. This is good because the Tour is the biggest race and pretending the Vuelta is worth as much would only devalue the system. It works on a second level too because the Giro-Vuelta double is more amenable that the Giro-Tour or Tour-Vuelta combos, just as Fabio Aru who placed second and first in the Giro and Vuelta and collected a lot of points for it but should he be ranked superior to a Tour winner? Yes because he collected more points by racing two grand tours and no because he’s probably not yet at Froome’s performance levels. Rankings may be official but they’ll always be subjective. As well as the Tour’s pre-eminent position you can also see two tiers of World Tour races where some stage races and one day races win more points than others. It’s a bit of a head-scratcher when the winner of the Tour Down Under earns 500 points while Tour of the Basque Country is worth 400, or Gent-Wevelgem is valued more than the E3 Harelbeke. It’s here that the points system looks like it’s trying to put a value on races that are harder to quantify given the calendar has a rich mix of races each with their history, prestige and importance and trying to label them with a set tariff points makes them look homogeneous on paper when in reality they’re not. A win in the World Championships road race is worth almost double (600 points vs 350) than the time trial. It’s also more valuable than any other one day race on the calendar. Debatable perhaps but given the UCI owns and promotes the Worlds it’s inevitable. In the same sense the UCI derives most of its legitimacy from the International Olympic Committee and a large share of funding too so the Olympics will always come with a bumper points haul. Long tail: previously you had to place in the top-20 overall in a grand tour or the top-10 for every other race, now points go down to 60th place. As the chart above shows the winner takes all, points go to the very best riders rather than for finishing the race with a steep slope through the top-10 overall. However if winning the Tour de France and Worlds brings in a lot of points, the system is not necessarily tilted to star stage racers and one day superstars. Win a stage of the Tour de France and you collect 120 points, win an HC-level race like Dwaars door Vlaanderen, the GP du canton d’Argovie, the Ride London Classic, the GP Fourmies, the Primus Classic Impanis and you get 200 points. Win these five races and you’ve got 1000 points, equivalent to the Tour. So a sprinter taking several HC wins can thrive, the same for a punchy rider who, in late September, can try hilly HC races like the Giro dell’Emilia, the Tre Valli Varesine, the Giro del Piemonte and Milano-Torino and potentially come out with as many points as they’d take from the Giro. Points per jersey: new for 2016 is the reward for winning a points or mountains classification at the end of a grand tour but the reward is modest: the same value as one stage win and equivalent to finishing 11th or 12th overall. Points per day: another novelty is the daily “rent” earned by a rider wearing the leader’s jersey. Wearing the maillot jaune or maglia rosa jersey for a few days can be transformational but it’s only worth a few points here and this makes sense as a long spell in the jersey, for example Chris Froome’s 15 days in yellow last year would earn him 15 x 25 = 375 points, plenty already. Rankings and Rantings: if you’ve made it here you might have an understanding of the new system only beware the UCI has decided to keep the World Tour rankings too. So we will have a UCI World Ranking and a UCI WorldTour Ranking, each with very similar sounding names which is bound to confuse. Imagine if tennis issued ATP rankings and ATPP rankings too. Of course they wouldn’t do this but cycling somehow does. The old system remains the same with blank scores for everyone on 1 January and the same old point scores. This will add to the muddle with 200 points for the Tour de France in the WorldTour Ranking system but 800 points in the World Rankings. Priority? Will the new UCI World Ranking take over as the top ranking system? Ideally it would given the dynamic rolling calculation and the global aspect that covers all the pro races. But it’ll be compiled every Monday while the UCI WorldTour Ranking goes out on a Sunday which means it’ll be cited more often and probably get flashed up on screen after a race meaning several million TV viewers will see it while comparably few will visit the UCI website or the cycling news sites to check Monday’s updates. We’ve got a new rankings system but we’re keeping the old one too and both have similar sounding names. Confused? It’s almost as if you’re supposed to be. The new UCI World Ranking is a good idea as it ranks all male cyclists around the world from their results in all races. It brings new features like extra points for winning the points or mountains competition in a grand tour as well as points for wearing the leaders jersey every day in a stage race. It’ll be a usual reference but could struggle to take off as a talking point for the general media and casual followers because the older WorldTour Ranking will be published ahead of it. For all the quantitative analysis and arithmetic, a good rankings system has to feel right, to reward champions rather than calculators. Indeed a ranking system in cycling is always awkward, what makes the sport so good is the contests on the road rather than tabular points lists. Any rankings remain primarily an exercise in arithmetic, a handy tool for analysis rather than a goal in themselves. Has anyone ran 2015 results through the new ranking system yet (for testing/shits-and-giggles)? 4. Van Avermaet 1714, 5. Quintana 6. Purito 7. Froome 8. Aru 9. Contador … within 150 points. One would say that ASO should be satisfied that the TdF winner is promoted to 3rd rank by the new UCI system, but they are not, because the non-zero value of non-WT races causes kinda inflation. In the old UCI ranking Sagan did not reach even top ten, as his great results in California and Worlds gave him zero points (!). As a fan, cycling is more enjoyable if you pretend the UCI doesn’t exist. InRing, thanks for not subjecting us to Sagans Grease tribute like all the other websites. Might make sense not to eliminate the old system prior to at least a year’s worth of data in the new and even then 2 years just to see how it shakes out. I agree, and I’m guessing that’s their intention. If only they had just released a couple of sentences explaining it. Any ranking system is disutable. Is the worth of the Tour-GC double then a win at Roubaix? More? Less? At least this ranking is more useful for the world championsgips qualifing as the circuit rankings. For example: The Sanremo-win of Ciolek doesn’t counted in any way, because as a ProCon rider in a WorldTour-race his success he’s got any points in the WorldTour and no points in the EuropeTour. And any success after the worldchamps were worthless for the worlds – obviously for the current year, but even for the next year, because they started on zero each year. * The world team trial doesn’t count for the individual ranking. As far as I understand it’s the same for any male team trials. Regarding the womens ranking they divide the team points, for all races but the worlds. * We have to much rankings (20): WorldRanking (riders an nations), WorldTour (riders, teams and nations), same for five continental ciruits. **The Oceania Tour is a calendar nearly without races. Leave it to the UCI to make things even more complicated. I still don’t get why we need ANOTHER ranking. I really don’t believe these guys are living/working in “reality”; it’s like they’re in their own little world. I have never said or wrote anything negative about the UCI before, but it seems to me that now they are incapable of displaying any form of common sense. Between them and ASO I don’t believe better days are ahead for our sport. They seem willing to go to any means necessary to try and get what THEY WANT; power/control/money/etc. They fight each other and/or act as bullies, using the teams/riders/even sponsors as pawns. Negative effects to cycling are viewed as collateral damage; the attitude I see displayed is “if I can’t have what I want, neither will anyone else”. Then they come out with this additional ranking. I just don’t get or care for the M.O. if either organization. Rant over. This seems to have the potential to be a better ranking system and I especially like the rolling calculation. It will take a year or two to fine tune. I imagine that the facts to have the real conversation are a year away, but ASO races dropping to HC events from WT events will complicate any ranking system, which will be a boon for pundits column inches. Pretty sure I made the same comment I am about to make this time last year when the proposed (subsequently dropped) reforms were analysed on this very site……the Monuments are not called the Monuments for nothing. I really fail to see how they can be worth the same as the TDU or Grand Prix Quebec? Stage races or not! They should have their own category, like the Tour and the other two GTs. Just my two pence/cents! I still think that domestiques/teammates should get points for a teammate’s win or high finish, since cycling is such a team sport. For example, the teammates of the race winner and the others in the top five, that finish outside of, say the top twenty, should get a percentage of the points achieved by their teammate achieving the top 5 result. How about 10% of the points if the domestique finishes the race, and 5% if they don’t finish? This can, of course, be tweaked but it would be a way to reward those who help achieve the win but don’t record it themselves, and could do away with teammates working in their own interest come contract time. I think it would help reinforce the team aspect of the sport. Teams should get the points. Riders can get the glory, prestige, satisfaction through winning races, gaining jerseys, finishing on the podium or a high placing. Yes, if one must have points, then this is how it should be – although points are only necessary if there is some sort of promotion/relegation for the WorldTour. That way teams are judged on their previous year and you don’t have riders ‘taking points with them’ to their new team – and the nonsense we had previously where a rider who was leaving at the end of the year wasn’t allowed to ride big races as they would take away team points. My guess is that most fans pay very little attention to these superficial classifications because they understand that they are simply a committee made plaything, failing completely in their supposed purpose. If there was a significant overall prize/s (Pernod of old anyone), and a more acceptable and easily understandable points system – containing probably only the very best one day races, maybe, just maybe such a system would garner some interest. Until then, the whole charade will continue with very little interest, and certainly no financial point, until the winner is announced at the conclusion of the season. +1 What was so awful about the old Pernod Prestige rankings? 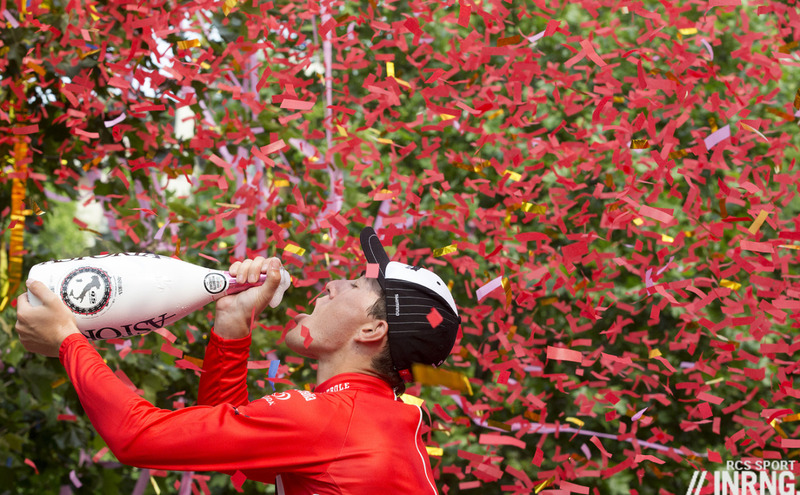 ANY setup where a victory at TdU = victory at one of the five Monuments of Cycling is a joke….and the joke’s on us. What was so awful about Super Prestige Pernod? For instance in 1976 a victory in Four Days of Dunkirk would have given you 50 points while a victory in L-B-L would have given you 45 points. The point I was making about the Pernod was that it gave riders worthwhile cash prizes, which were keenly fought over – I thought more financial support would be welcome. I don’t know for certain, but I suspect events selected for inclusion probably found their race funds increased by the sponsor as a result. That the competition was a French based idea, with a French sponsor and a French bias should not distract from the fact that it was keenly followed by fans and riders alike as a meaningful, prestigious and comprehensible competition. The competition finally ended when alcoholic advertising was banned in sport sometime in the 60s. We are now left with but a shadow, that provides fans with little interest and event organizers and riders with little or no financial incentive to contest the classification – they don’t even receive a jersey to denote leadership. 1987 was the last year of the Super Prestige Pernod, and Stephen Roche was the winner. But, this is really the problem Larry T and Francesco have with Pernod, despite the fact that they couched their unhappiness in terms of their dislike of an ancient and obsolete points systems which no one would think twice about reconfiguring today: “it gave riders worthwhile cash prizes, which were keenly fought over”. I.e., it motivated riders to perform for cash. Enlightened people don’t want a system in which the lust for filthy lucre is what motivates riders to perform at their best. We want a system in which the riders cycle race out of love for cycling, like we do on Sundays. Who but the most crass could be inspired to achieve aesthetic beauty on the road by riders who are motivated by the cash offered by a corporation? And, isn’t that what professional cycle racing should be, if it is to take a legitimate place in a non-exploitive and pure social world? An prize system would make us ill every time watched cycle racing. Therefore, we have a moral imperative, as true stakeholders in the sport, to push for a system which removes cash incentives and fosters nothing but a pure love for cycling as an expression of human aesthetic virtuosity. Thanks Ronin, but I can express my own thoughts. I have no issues with prize money and never have but the increase of monetary/business interest at the cost of sporting values troubles me. Same with complicated rating systems that reward the winner of TdU equal to L-B-L, Roubaix, Flanders, Lombardia or MSR. The globalization project begun by Verbruggen has done little to improve things while doing a lot of damage in my opinion – the World’s in the middle of a desert is but one example. The current industry wet-dream is the fat bike, will we soon be watching them be raced over sand dunes with the winner getting a rainbow jersey? I agree with pretty much everything else you have to say on this. I agree, despite the French bias the Super Prestige Pernod had nice cash prizes which were certainly welcome and it had nothing to do with UCI or any national federation. SP Pernod was entirely run and financed by the PR department of Pernod. So no jersey for the leader of the SP-P, no extra money for the organizers of selected races and Pernod (if my memory is correct) buying advertising space in the sport section of newspapers in the FIBS countries (France, Italy, Belgium and Spain) and The Netherlands to list the current standings in the SP-P. Looking at the history of SP-P I find it difficult to compare it with UCI’s World Ranking. The UCI World Ranking can, in my opinion, best be compared with tennis’ ATP Ranking. Both rankings have everything from the biggest events TdF/Wimbledon to the smallest .2/Futures event all over the globe. The ATP ranking is pretty well-known among people who follow tennis, although they have hardly any knowledge about the complex ATP points system. It even has a sponsor (Emirates at the moment). I would not be surprised when the UCI World Ranking will become a sponsored ranking system in a few years time with financial rewards for the riders who end in the top ten at the end of season. I understand the appeal of a monetary incentive for riders (and fans watching the competition), but your point about rankings always being subjective still stands! When categorizing/quantifying races or results you have to make choices and include/exclude categories. I guess Tinkov’s grand tour challenge is a little different in this respect because the grand tours are so clearly different from other races, something like a natural category. I guess you could do the same with monuments? Still though, even the Tinkov ranking will be subjective: would you rank on GC placings? Time? Are stage wins or secondary classifications also in the mix? What would the challenge mean if a rider who took more time over three grand tours would win the prize money over a rider who was faster but finished lower in placings? With the subjectivity of rankings in mind I think it’s quite nice that there’s more than one (official) ranking. Each with a (slightly?) different perspective on who is the best rider. Geoff. Thanks. At least it ended with a worthy winner. 4 stages of the TdF is worth less than the overall in the TdU? I think I know what I’d rather have on my palmares when I retire. Much as I love the only World Tour race in my home country, I’m under no illusions that it is anything other than a pretty competitive curtain raiser. Pretending to elevate its status to this is a bit of a joke. It’s interesting that the UCI seem so keen to ape CQ and ProCyclingStats. Perhaps they’re trying to close those sites down because they’re so successful? After all, Dave Brailsford has previously admitted to endless CQ analysis! Although I understand the need for the UCI, they do have this habit of wanting to inhabit all aspects of the sport in a way they don’t really need to (see dispute with ASO for example). 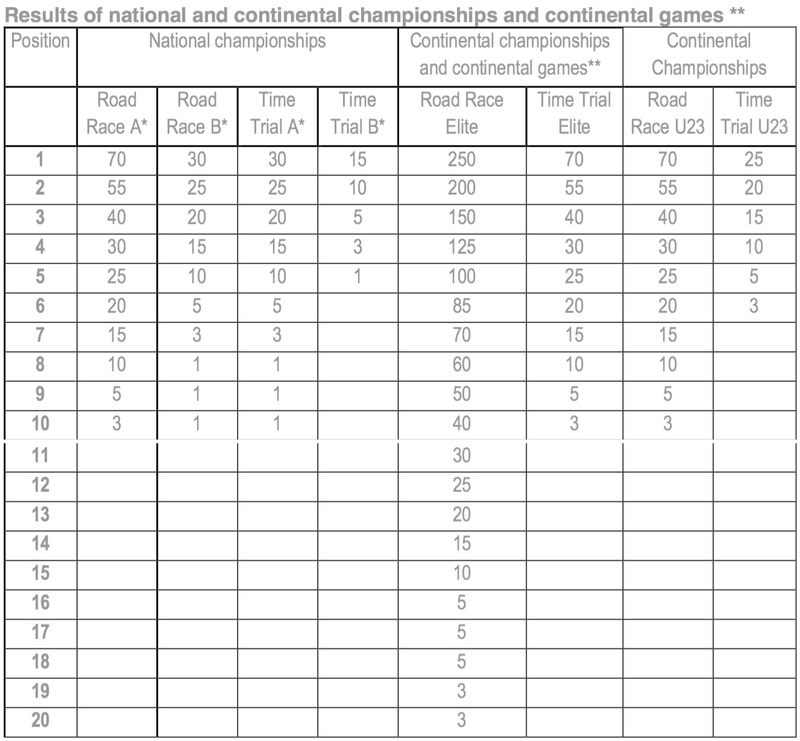 I edited it out above because the piece is long enough with the big tables of points already but the UCI owns the World Tour it’s surprising that they’re not owning the related rankings even more, ensuring that these races deliver premium points. If anything the new rankings dilute the World Tour as they’re a different system and also because the “World” label just dilutes the brand. ProCyclingStats will probably have the results online a day before the UCI publish them. Weirdly enough, the UCI have divided up the points per race differently for their two different ranking systems: in the World Tour Rankings, the Monuments are ahead of the other one day races, and all the non-GT stage races are equal; in the World Rankings, GW, Amstel Gold and the (ahem) Canadian Classics are equal with the Monuments, and the stage races are in two categories. So it’s not just a case of the WT rankings being a subset of the World Rankings, they’re on a different basis. Is this a typo in the rules or just typical UCI? I thought that the stage races in the WorldTour rankings were also in two groups – e.g. the likes of Romandie and Paris-Nice being worth more points than Poland and TDU. But yes, how they came up with the points for the one day races in the new rankings system is beyond any kind of logic (naturally). I’d liked the 2015 try more than the ranking now. No more individual and nations ranking in the WorldTour and same point scales for the WorldRanking. I thin they’ll change the WorldTourRanking next year. I think it’s a shame they don’t value the green or polka dot jerseys much more – worth the same as 7th place in E3? I don’t think the Superprestige Pernod is comperable with the UCI Worl Ranking. The SPP was a cup with selected races as the UCI WorldTour is or the UCI World Cup was. A world ranking works diferently, it contains all international races. The UCI World Ranking is more similar to the ATP World Ranking or the FIFA World Ranking. It’s a way to qualify sportsmen and teams for international events. Some freaks like me are interested in such stuff. For the general public it doesn’t really matters. * 65 points for Paris-Roubaix, 60 for Milano-Sanremo, 60 for Paris-Bordeaux, 45 for Liege-Bastogne-L.
Wow! That was a balanced point scale? No way! I don’t rate a podium finish – for me, only victories matter – so the rankings system means little. I’d have thought most feel the same way: most reading this blog would care who won Paris-Roubaix in 2006, but would care little about who topped the overall rankings that year. To take last year’s rankings ‘winner’, Valverde’s consistency is impressive, but I’d have been much more impressed if he’d, say, targeted the Vuelta and won it last year than come third in the Tour. But doing quite well in two grand tours a year is what wins him the rankings, along with his one day race prowess. But he seems to be someone who loves podiums – hence the welter of races where he has refused to work for a win at the risk of jeopardising his high finish (last year’s Amstel being the latest example of many). Does anyone think that Valverde had a better season than Aru, Degenkolb, Froome or Contador? That’s why I don’t think these rankings are a good idea – even for ‘casual fans’. On top of this, as Inner Ring says, these are arbitrary points allocations and do not tally with the actual value of the races – e.g. Quebec and Montreal worth more points than Fleche Wallone and E3: which would you consider more prestigious? And Quebec and Montreal are worth the same as Monuments – in what world? Many other examples given above. I can’t see any great purpose to these rankings – even if the points allocations weren’t awry: the Inner Ring’s last paragraph sums it up. And only the UCI would have two rankings systems – both of which are pointless. The more the UCI do, the more they do badly. In response to a few comments above, if you have a system where you actually get cash for an overall season prize, you end up with a situation of someone riding for fourth in a season-ending race, because that’s what they need to take the overall prize (has happened before). Most importantly, focusing on points ignores the many hard-working team members who win teams races, but don’t win points. That’s the biggest reason not to have a rankings system at all. This could even affect riders’ salaries and abilities to get a contract (and has in the past, when teams needed points to get into the WorldTour). I’m not so put off by the idea of an overall prize, as it’s effectively just a season-long points jersey competition. Rather than “riding for fourth”, the person concerned will actually be riding to finish a certain number of places ahead of a competitor, so not massively different from a points or KoM competition now. Though if you don’t like those competitions, I can see why you wouldn’t like a ranking system. I just think that all races are better raced individually, rather than having riders concerned about placings. “Races better raced individually” (J Evans). Does this mean that you aren’t interested in the General Classification in Tour/Giro/Vuelta etc? It was obvious what I meant. For me any ranking system trying to include one day races, stage races and stages within stage races is always going to be a compromise. For example Tom Boonen and Chris Froome are two very different animals doing two very different things. I don’t see why there can’t be seperate rankings. A few months back the UCI said their new system would result in different rankings for sprinters and stage racers. Presume that’s no longer on the cards? Thanks INRNG, I asked and you delivered. We use the rankings for our fantasy league, imperfect yes, but it’s the best thing we have. If someone has something that works better please let me know. I agree with Geoff about domestique points and I like the inclusion of points for secondary jerseys. But I would still like to see points (a very small amount) for intermediate sprints and kom points. 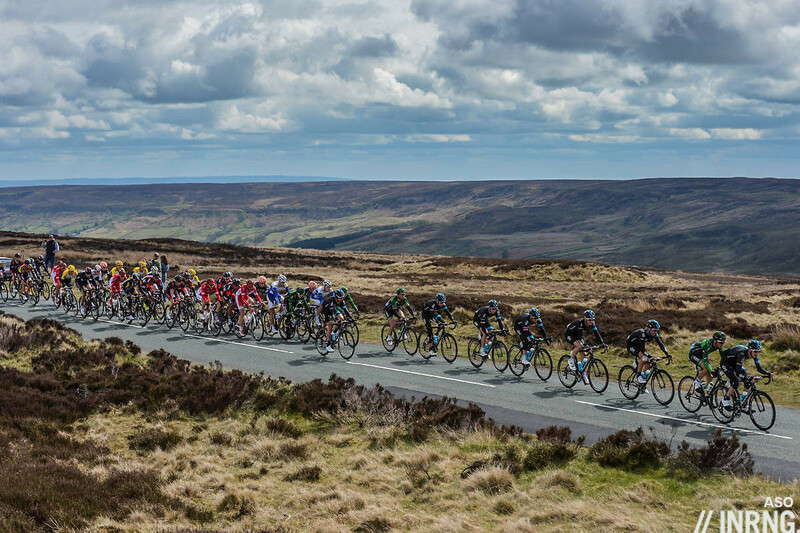 As a fan I hate watching the peloton or worse a breakaway just roll through a sprint. These are usually in a fan freindly place and should serve to spice up the early part of the race. Also, anytime you can make the breakaway more important I think it makes for better watching. I believe this is all a system (regardless of points allocation) in search of relevance. Does anyone truly care? Most importantly, do the riders or teams care? For the most part, sponsors want their teams to win races (or achieve notable results) because that brings publicity. Teams want to win races, because they can attract sponsors and talent with the publicity and prestige earned. Teams will target certain races, because their performance in these matter to their stakeholders (could include fans) more so than some other events, though all wins are good. Racers want to win races because it earns them money, prestige, and better contracts with their teams. A domestique’s value is derived by his ability to help his teammates win races; some riders are valued for their future potential. If the ranking points don’t factor in trade team selection into races, if there is no true prestige publicity, or direct prize money tied to the rankings, I wouldn’t expect the riders or teams to care too much about them. I don’t believe these rankings will affect rider salaries or appearance fees at the top of the charts; these riders are already earning as much as is available. Will it matter lower down the chart is a different question. You chose a poor example saying that tennis would never release two rankings, they actually do: the ATP and ATP race rankings. They follow a similar pattern, one rolls over the previous 52 weeks, the other (the race) over the current calander year. I believe golf does the same. But do the ranking systems used by tennis or golf cover different tournaments, or give different points for the same tournaments? Any ATP-competition, any Davis Cup round and any GrandSlam counts for the ATP-Ranking (52weeks rolling system) from 12pts. up to 1000 pts. with 20 different levels. It´s similar to the UCI World Ranking. Nine of these 20 levels (from ATP-International Series to the GrandSlams, without fe. Davis Cup an minor ATP-competitions like Future and Challenger) count for the ATP-race (calendar-year based ranking) from 35 pts. up to 200 pts. It´s similar to the UCI WorldTour-Ranking. Would like to see “assist” points awarded. To me, if your leader is in the top 5 at the Tour and you finish the race, even last – you should get something. * “UCI WorldTour Rankings” for riders, teams and nations. Those rankings are called all “world” and “ranking”. They could seperate a ranking from a classification. Or – even if I disliked the denomination “ProTour” – separate “World” from “Pro”. Or even better – cause I don´t like “Tour” for calendars in cycling, because in cycling the “Tour” is the “Tour de France”: call it “World Ranking” and “World Cup”. And: Nobody needs a nations-ranking of the WorldTour. Ok, they used it for the worldchamps-qualifications, but for that they have now the “Elite/U23 World-Ranking”. They won´t follow me. I no. Sorry if I missed it, but isn’t this another ring in the UCI v ASO circus? The table is headed ‘UCI WorldTour Events’ and has the TdF listed with its own high points tariff. – What if TdF is not a WorldTour event? Does it get demoted in these ranking points too? The UCI had promised to bring this new system so it’s got little to do with ASO. 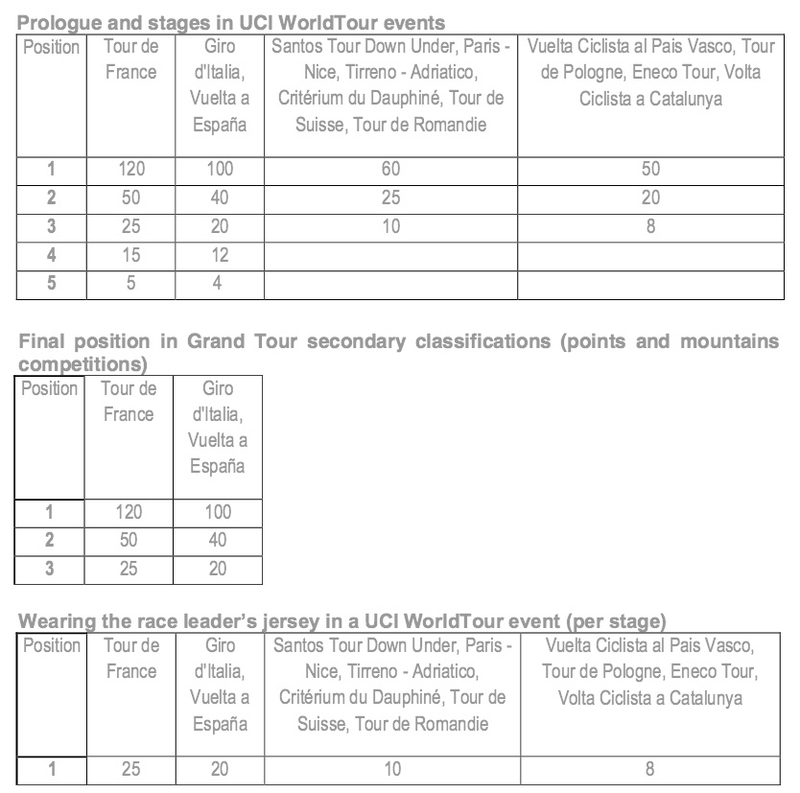 If the Tour is no longer in the World Tour then the points system will need to change, the system would be undermined if a win is only worth 200 points, equivalent to a win in the Critérium International etc. I’m sorry if I’m a troll. I have been reading your site for at least two years. Would it be okay if I join the fray? Not really fair that Pais Vasco, Donostia and Catalunya are in lowest category IMHO. Also I feel that both GT and stage wins should get a slight upgrade compared tot the classics and short stage races. One classic is worth more than four Tour de France stages, which might be to much. Also winning two short stage races shouldn’t be equal to (or be worth more than) winning a GT.